Can I install laminate click flooring over concrete slab? Definitely! Installing laminate flooring over concrete is definitely an option. One of the many advantages of click laminate flooring in fact lies in its versatile installation options that don't require as much effort, resources and time compared to traditional hardwood. Before you head off to your nearest department store or check out various online tutorials, here are some tips to keep in mind when trying to install click laminate flooring over concrete slab. Ensure that the subfloor is entirely even – this is one of the most crucial points when it comes to installing any type of flooring. Installing underlayment for laminate flooring is the next imporant step! Add a layer of padding on top of your moisture barrier to achieve maximum comfort. Last but not least, always make sure that your concrete layer is as clean as possible! 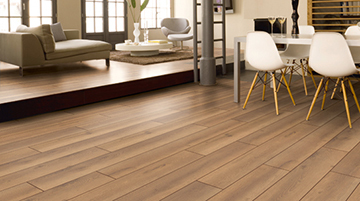 We recommend that you always rely on professional services when installing any new flooring, including laminate. This way you will not only get the most professional-looking result, but will also ensure the optimal durability of your laminate flooring. Can you install laminate flooring in a bathrooom? Now that we've answered the question whether or not laminate click flooring can be installed over concrete, it's time to move on to the next frequently asked question: can you install laminate flooring in a bathroom? Contemporary production techniques have definitely made it possible to install laminate into various living spaces, regardless of the external influences they might be exposed to. All this makes installing laminate flooring in your bathroom possible, but you do have to make sure to only rely on trusted brands. At Floor Experts, we offer an exclusive line of highly resistant laminate flooring that is carefully produced to ensure high durability in various circumstances and living spaces – including kitchen, bathrooms and business areas. We also offer a wide array of other flooring types with incredible price-to-quality ratio! At Floor Experts, you are able to go from selecting to purchasing and finally installing your dream flooring in the shortest amount of time. A large selection will ensure that there is something perfect for every single household!